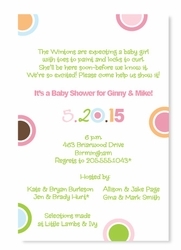 Description: A due date themed baby shower is great for baby girls, boys or even a gender neutral shower. Choose the color scheme that suits your needs best from the dropdown menu. Also sweet for a couple who is adopting with the date being when they are due to bring baby or toddler home.